The World Wide Fund For Nature (WWF) is a leading global conservation organization, it’s mission is to build a future in which humans live in harmony with nature. 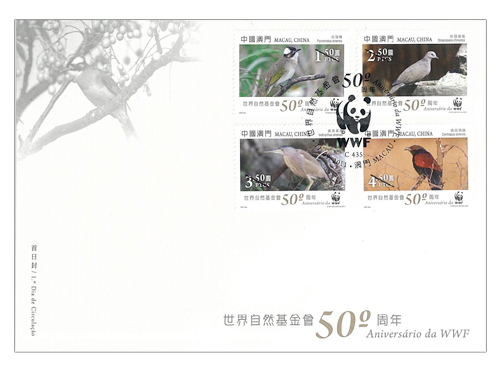 On the date of 11th September, 2011 marks the “50th Anniversary of WWF”, Macao Post will issue this stamp theme by promoting the message of protecting wild animals and plants and to preserve the earth means to protect ourselves. 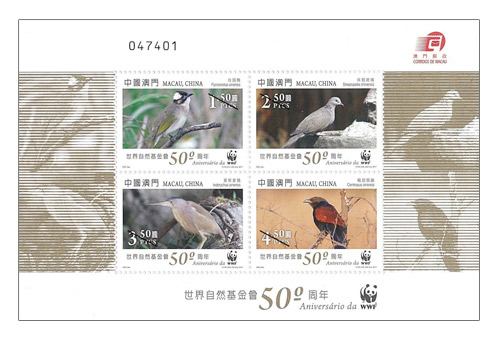 This issue includes a set of four stamps and one souvenir sheet, the local birds in Macao are displayed on the stamps. 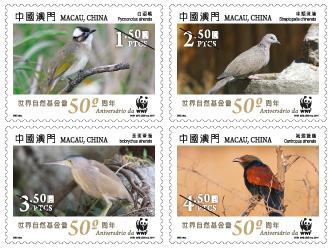 Among these are “Light-vented Bulbul (Pycnonotus sinensis)”, “Spotted Dove (Streptopelia chinensis)”, “Yellow Bittern (Ixobrychus sinensis)” and “Greater Coucal (Centropus sinensis)”. 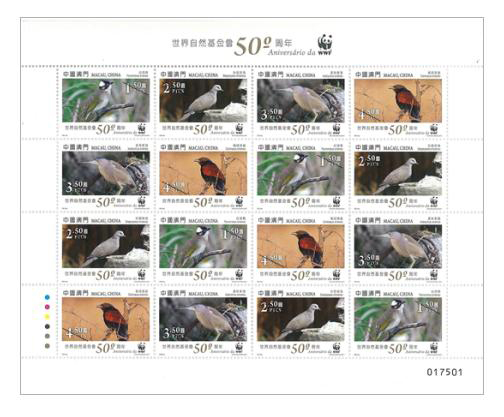 The souvenir sheet includes the full set of stamps. 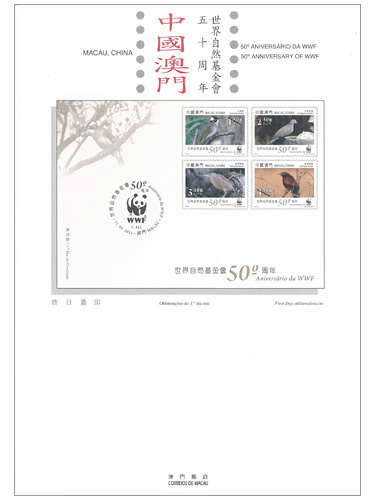 The stamps and souvenir sheet are bearing the WWF Panda logo. 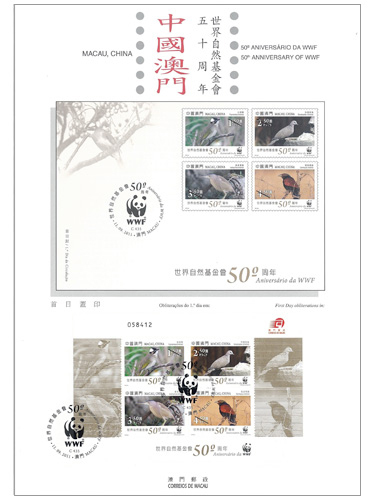 The composition of this issue is designed by Macao Post, and the text of the information brochure is written by the President of the Macao Ecological Society, Mr. Ho Wai Tim. 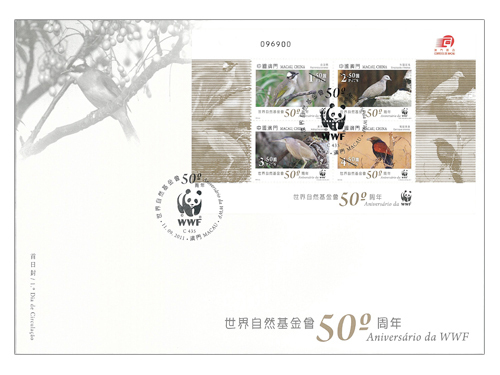 This is the sixth issue in 2011. 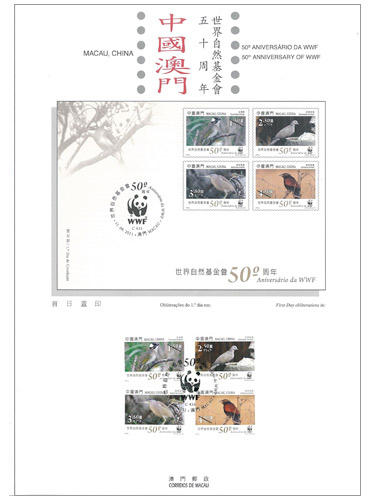 The previous issued stamps are “Lunar Year of the Rabbit” on 05/01/2011, “Mainland Scenery IV” on 01/03/201, “Public Buildings and Monuments” on 19/04/2011, “Cantonese Naamyam” on 30/05/2011 and “Legends and Myths IX – The Legend of the White Snake” on 28/07/2011. 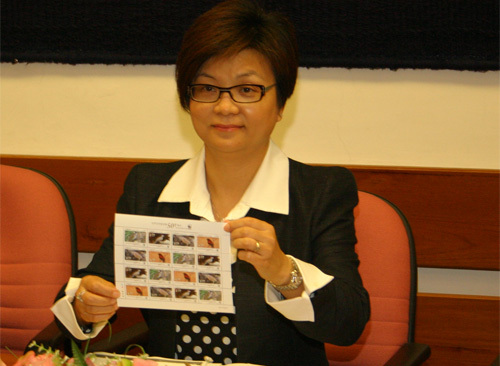 To commemorate the World Heart Day, Macao Post announced that a Temporary Post Counter will be set up at the Park of Iao Hon Market, at 16H30 to 19H30 on 25th September 2011 providing the commemorative postmark cancellation service for the “World Heart Day”. 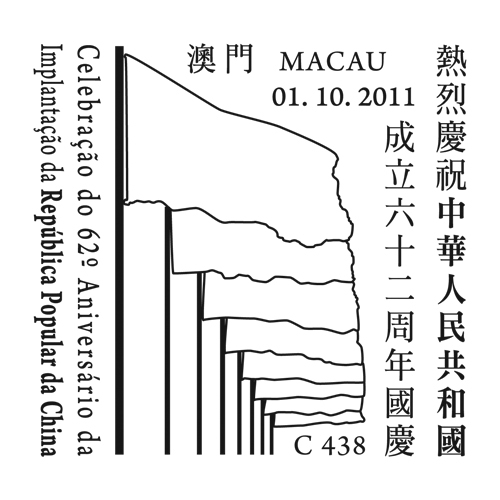 To celebrate the 62nd Anniversary of the Establishment of the People’s Republic of China, Macao Post announces that a Temporary Post Counter will be set up at our Philatelic Shop located at Macao Post Headquarters at 9:00 to 17:30 on 1st October 2011 providing the commemorative postmark cancellation service for the “Celebration of the 62nd Anniversary of the Establishment of the People’s Republic of China”. 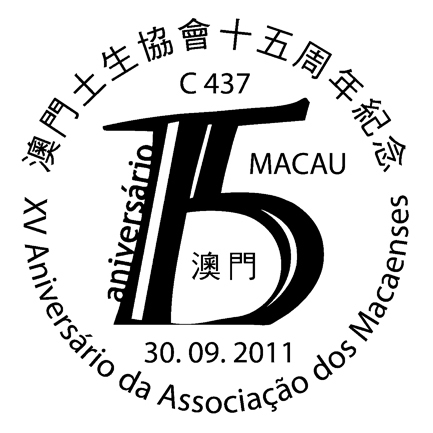 To celebrate the XV Anniversary of Macanese Association, Macao Post announced that a Temporary Post Counter will be set up at our Philatelic Shop located at Macao Post Headquarters, from 9:00 to 17:30 on 30th September 2011 to provide the commemorative postmark cancellation service for the “XV Anniversary of Macanese Association”.